No one likes litter, so why do we live with it? Litter directly impacts a community's health, safety, and economic potential. At Rubbish, we believe people should love where they live. That's why we created the Rubbish app, which empowers neighborhoods to tackle litter at the local level by photographing and reporting litter, sharing and analyzing the data, and engaging community partners to clean up together. Our mission is to build stronger, healthier communities with less trash, more beautiful streets, and happier residents and we can't do it without Firebase. 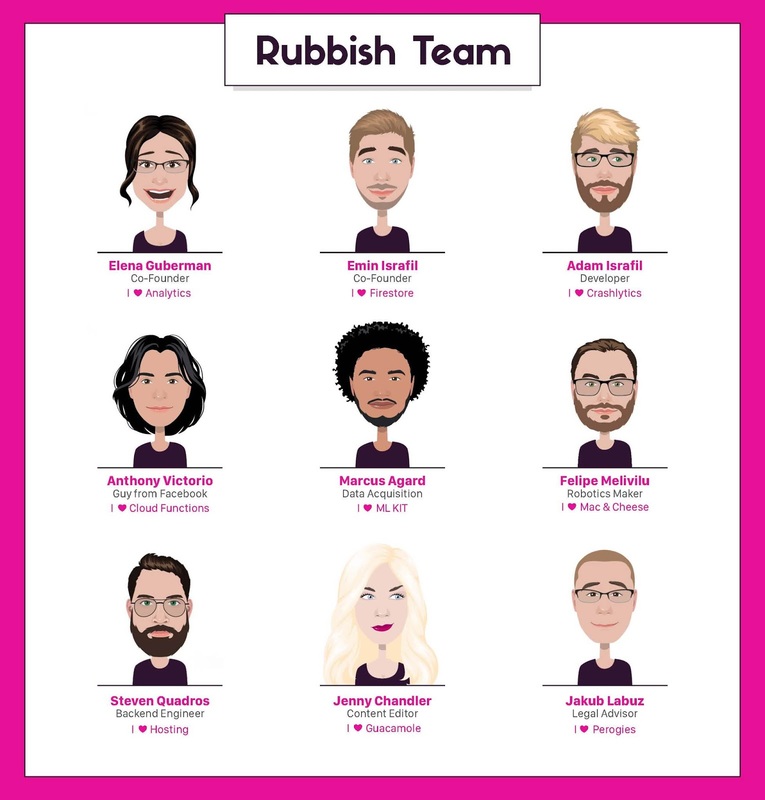 The concept for Rubbish resulted from a moment of panic and frustration: while we (Elena and Emin, co-founders of Rubbish) were walking the streets of New York City with Elena's dog Larsen, he choked on a chicken bone. Luckily, he was ok, but the two of us were not. Why was litter an unfortunate part of city living, with no effective solution to address it? This is Larsen. He's a good boy. We decided to tackle this issue and find an innovative solution together. We started to document litter daily, taking pictures and noting problem areas in our communities, which quickly accumulated into thousands of photos sitting in a stagnant shared album. We needed a better way to store and organize the information we were collecting so we could use it to make a difference. We also needed a way to share the photos and their metadata with several audiences (governments, community partners) and on several social media channels through our app. Each platform had its own set of requirements and specifications, and the idea of creating the infrastructure to accomplish this was daunting, until we discovered Firebase. To combat the litter problem and make real change, we needed a quick, seamless way to gather, process, and share all the information surrounding each documented piece of trash. We evaluated lots of options, but Firebase stood out because it provided a comprehensive set of tools that allowed us to quickly build the backend infrastructure of the Rubbish app and address the challenges of storage, data validation, processing, and distribution. For example, we faced the challenge of quickly storing and tracking user-generated photos. Cloud Storage and Firestore allow us to keep track of what is being reported and where. Another challenge was verifying user submissions, especially ones requiring priority attention from third parties, like reports that need local agency involvement. With the help of Cloud Functions for Firebase, we set up a dashboard to summarize the data and generate reports in one place. We also instrumented Cloud Functions to act as a safety net and help us with quality control. For instance, before reports are automatically formatted and sent to local government agencies like San Francisco 311 for follow-up, the functions check that the submissions came from validated users with good track records, and are in the correct vicinity of the agency. We use Cloud Functions to trigger a validation review via our backend and via email whenever a photo is uploaded. Then, a member of our team evaluates the uploaded image to make sure it's clear and relevant. This makes an otherwise complicated process easy and automated. Additionally, we use Firebase Authentication and Security Rules to ensure that only the intended information gets shared, and to protect each user's privacy and security. Firebase allows us to seamlessly integrate our data with APIs from local governments, social networks, and our own app in a few lines of code. 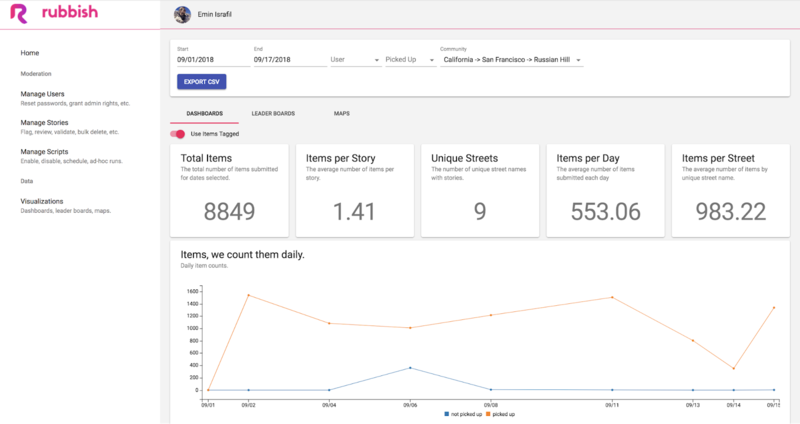 With Firebase, Rubbish can effectively store, share, and process the data to create real insights and impact. In addition to Firebase, we also use some of Google Cloud Platform's APIs, such as the Google Sheets API, Maps SDK for iOS, Places API, Geocoding API, and Cloud Runtime Configuration API. Firebase-powered dashboard that allows us to manage user submissions. This is one of our dashboards for tracking neighborhood trends. 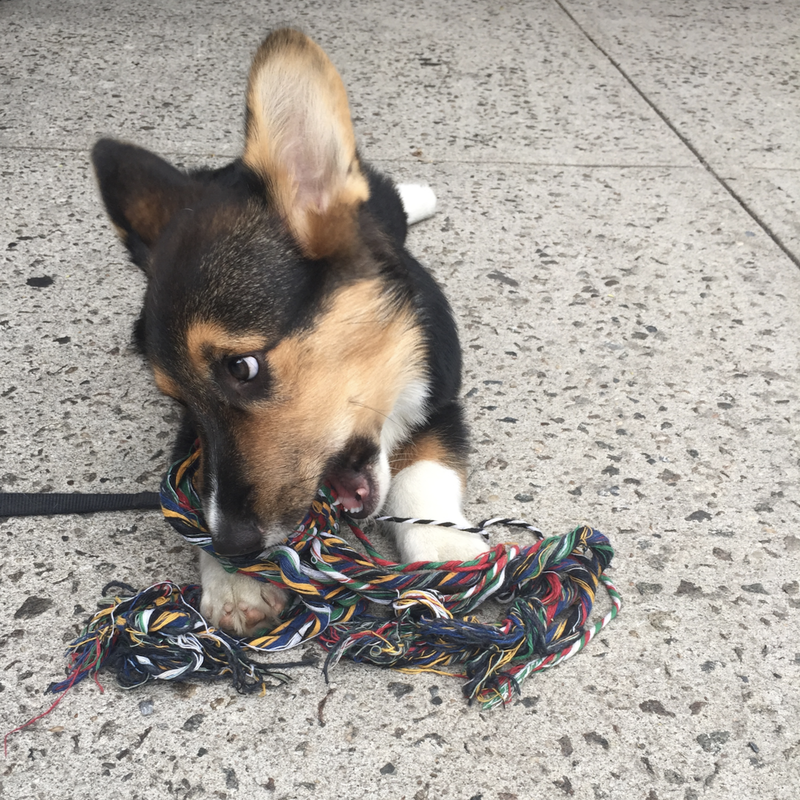 As we grew our software development team, we were concerned about the time and resources it takes a new team member to get up to speed and become productive. Firebase provided easy onboarding of new members with user-friendly training resources, like robust sample projects, fun developer videos, straightforward technical documentation, and more. In fact, our new engineers are onboarded and ready to contribute three times faster, saving us significant time and resources that can now be focused elsewhere. We reduced development time on new features, as well as the time needed for maintenance, security handling, and developer onboarding, which maximizes our productivity. In short, Firebase enables start-up teams like us to communicate effectively, share information, and grow. It's a huge value for us that Firebase allowed us to effectively engage such a variety of talented, passionate individuals. Our team and their favorite Firebase product or their favorite snack. 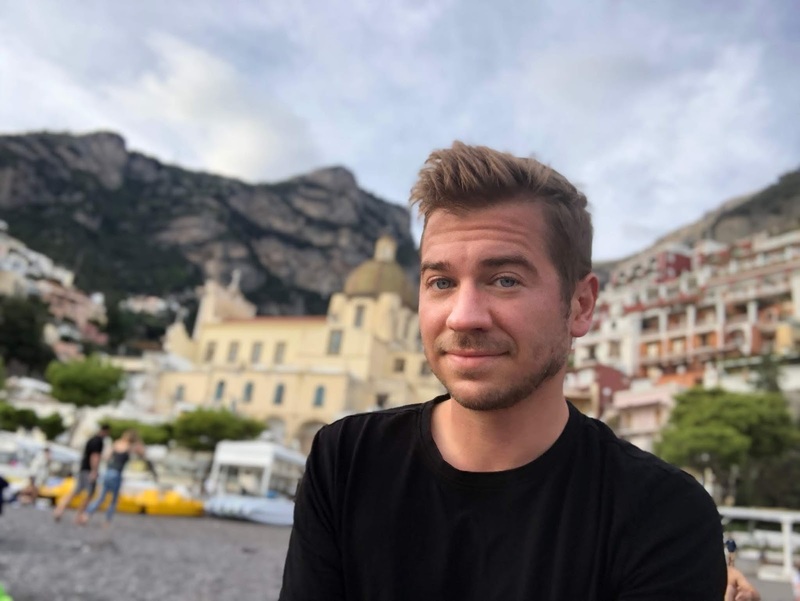 Since Firebase covers the backend infrastructure behind the app and facilitates collaboration on our team, we can focus on expanding our field testing and cultivating relationships with important partners. We launched a pilot program on San Francisco's Polk Street in August 2018, working with the community to sponsor resident-led street cleanings. We use the data we collect to inform local sponsors and residents about the progress, including summaries of the number and types of trash collected - all that wouldn't be possible without Firebase. We've also been collaborating with the San Francisco Community Benefit Districts and the local San Francisco government to optimize and track improvements through Rubbish. For example, we pinpointed the largest source of cigarette butts (customers at bars and restaurants) and worked with these businesses to install cigarette receptacles. We're excited to find even deeper trends and new ways to analyze and address the litter problem. As Rubbish continues to map and track litter, we are finding that trash patterns on the street can be as dynamic as traffic patterns. Local events, the weather, and time of day all play a role in determining what your street will look like when you step out for your morning walk. The data we collect is providing insight into important trends like these and is being used to help local communities sponsor and track clean-up efforts in a meaningful way. By relying on Firebase to store, process, and analyze an increasing amount of data, we feel confident that we can engage and empower individuals, communities, and governments to tackle extensive, seemingly unsolvable problems like litter.